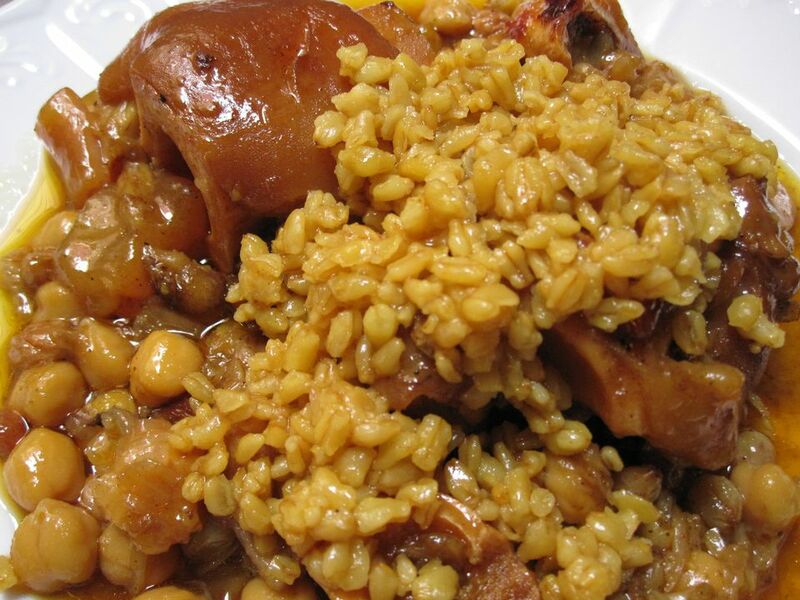 While offal and specialty meats may not rank high on everyone's list of preferred foods, the traditional Moroccan dish known as hergma is indeed a comfort food favorite for many. Here, chickpeas, wheat berries, and raisins are stewed is a well-seasoned sauce with kour3ine, a cut of meat sometimes referred to as trotters in English. It includes the hoof and lowermost portion of calf or lamb legs; goat feet may also be used. The prep time below is for preparation in a pressure cooker; allow substantially more time if cooking in a regular pot. The night before, soak the dried chickpeas in a generous amount of cold water. When ready to begin cooking preparations, set aside the raisins and wheat kernels to soak in separate bowls of cold water. Wash and clean the feet carefully. The hooves can be discarded. Also, remove any loose bone fragments. Wash the feet a final time by immersing them in water. Put the feet in a deep pressure cooker or heavy-bottomed pot along with the onions, garlic, spices, smen and oil. Add enough water to come almost to the top of the meat, cover, and bring to a simmer. Cook the meat for 1 1/2 hours with medium pressure (or 3 hours if simmering in a conventional pot). Stir and taste for salt, adding more if desired. Cover and continue cooking with medium-low pressure for another 2 1/2 hours (or simmer in a conventional pot for 5 hours – occasionally check on the level of the liquids), until the wheat is tender. You'll need to retrieve the cheesecloth to sample a wheat berry to see if it's cooked to your liking. Drain the raisins and add them to the pot. Cover and continue cooking without pressure to reduce the liquids to a thick sauce. To serve, arrange the meat in the center of a large platter and distribute the sauce, chickpeas, and raisins all around. Untie the cheesecloth and arrange the wheat on top of the meat. Tradition is to gather round and eat communally from the serving platter, using pieces of Moroccan bread for scooping everything up. The dish can be made in advance. It will keep for several days in the fridge or several months in the freezer. You may want to portion it out when freezing, particularly if not everyone in the family enjoys it. The feet and lower leg have relatively little meat, but the tendons, fat and connective tissue around the joints are flavorful thickeners for the sauce, which is where the real appeal of this dish lies. A very long cooking time is required, so the use of a pressure cooker is recommended. Alternatively, the dish may be conventionally simmered all day or overnight. Adjust the quantities of wheat berries and chickpeas to your own family's tastes. Moroccans prefer dried chickpeas to canned in dishes such as this, so plan ahead to allow for overnight soaking in cold water. If you do substitute canned chickpeas for the dried, be sure to add them at the very end of cooking so that they heat through without turning mushy. Wrapping the wheat berries in cheesecloth is optional, but it does allow for a nicer presentation of the final dish.